A technical recommendation; a long-time client just lost several months of medical data from a crashed hard-drive and has to re-enter it from printout. It will cost them $1000’s. I hate to see that. If you are *not* running a web-driven backup solution then go set one up now; they are reasonably priced, effective and protect from exactly this problem. Here’s my favorite. I am paying about $17 a month for over 350gb of backup and online storage. There are plenty of other services, I researched quite a few, and in my assessment, this one was the best. 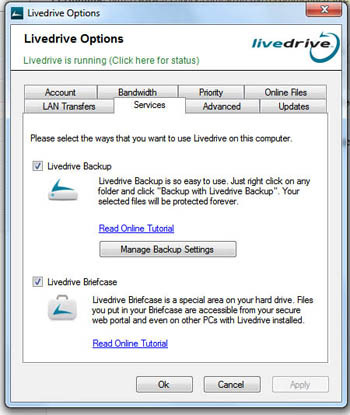 Live-Drive is cost-effective, easy to set-up, works on both mac and pc, and allows web-based access to files. The briefcase service maps a web-folder to your computer as a network drive, works with mac or pc…or even FTP, so if you use Linux (like I sometimes do), you can set up a script to ftp to it as well. Plus, there is a web interface on livedrive.com that will allow you to access, download or even view some files on-line. So, if you are ever at a client’s site, or friends, and forgot something, its there if you can get to an internet connection. We are most interested in the back-up services. They are pretty easy to configure. At install, a wizard will walk you through set-up, and if you ever need to change settings you can open the “live drivecontrol panel” from your start menu and modify the backup settings in the services tab. 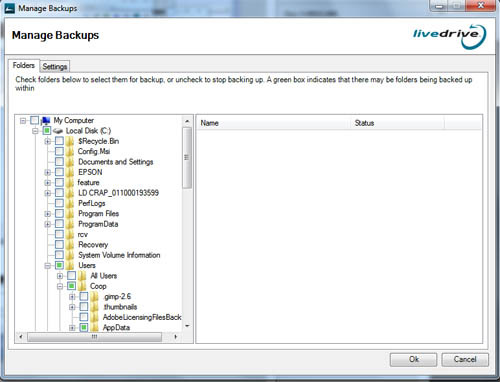 Click the “manage backup settings” you will get a file tree. 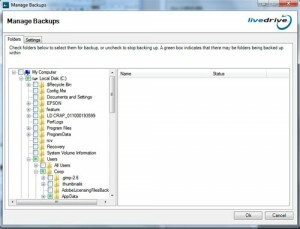 To make sure that you get proper back-ups, you need to know where your various software stores the information you want to back-up. In current windows software most information is stored under the user directory under “appdata” but some older programs (like the medical billing program this client uses) store data in directories off the C: drive or elsewhere. You can usually find out where data is stored by looking in the software’s preferences or settings. If you have trouble, contact the vendor, or let someone like me know, who can probably find it by remote desktop if needed. The first back-up may take several days to run, so just leave the computer on, after that, it runs small changes and goes much more quickly. 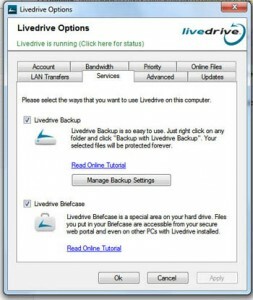 If you don’t like LiveDrive, use something, just make sure you back-up your work.